Sudan will withdraw from peace talks with rebels in the western Darfur region if no deal is reached by Thursday, its president has said. Mediators at the Qatar talks are currently in discussion with representatives of both sides. President Omar al-Bashir threatened to take the talks back to Darfur and deal decisively with anyone bearing arms. Rebels in Darfur have been fighting government troops and Arab militias, said to be backed by Khartoum. 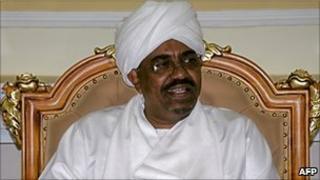 President Bashir told a rally in Darfur he had set a deadline of Thursday for the negotiations to be successful. "But if there is no agreement, we will withdraw our negotiating team and the talks will then be held in Darfur," he said. "We will fight those who choose to take up arms, but we will sit next to those who want development." The most heavily-armed rebel movement, the Justice and Equality Movement (Jem), has rejected the deadline. It called Mr Bashir's speech "a declaration of war". "It undermines the efforts of the international community and of the mediation to resolve this conflict through political means," spokesman Ahmed Hussein Adam told the AFP news agency. "JEM is committed to reach a fair settlement of the conflict, which is why we are here in Doha. If the Sudan government leaves Doha, we cannot have an agreement with ourselves." Khartoum has been seeking a comprehensive peace agreement with all the rebel groups at the Qatar talks. It had hoped to secure a deal before the end of the year, as an independence referendum in southern Sudan is set to dominate the government's agenda in January. Mr Bashir is wanted by the International Criminal Court, accused of war crimes and genocide in Darfur, but he strongly denies the charges. About 300,000 people have died since fighting began in Darfur in 2003, and some 2.7 million people have fled their homes as a result of the conflict, the UN says.